Warm sun, pristine beaches and the sweet breezes of the Caribbean…follow PuertoDISE and PlayaWeatherman on their adventures and experiences in the Riviera Maya! This reply was modified 10 months, 2 weeks ago by playaweatherman. Maps for next 4 days from SMN. This reply was modified 7 months, 2 weeks ago by beam-eye. Nice to have the links handy again, Sir. You’re not going to need to water the lawn for a couple of days, but doubtful you’ll otherwise need to change the routine. Now it’s orange, so changes afoot – keep your goo-loshes handy (footy). Also, looks like it’s trying to transit the Yucatan strait between us and Cuba. This reply was modified 7 months, 1 week ago by beam-eye. Tropical Storm Watch for Riviera Maya. Get all the details from the National Hurricane Center. The Government of Mexico has issued a Tropical Storm Watch for the coast of the Yucatan Peninsula from Tulum to Cabo Catoche. Warm sun, pristine beaches and the sweet breezes of the Caribbean…follow PuertoDISE and Playa Weatherman on their adventures and experiences in the Riviera Maya! This reply was modified 6 months, 2 weeks ago by playaweatherman. Here is link to images every one minute from 4:30pm to 5:00pm today from GOES-16 satellite. 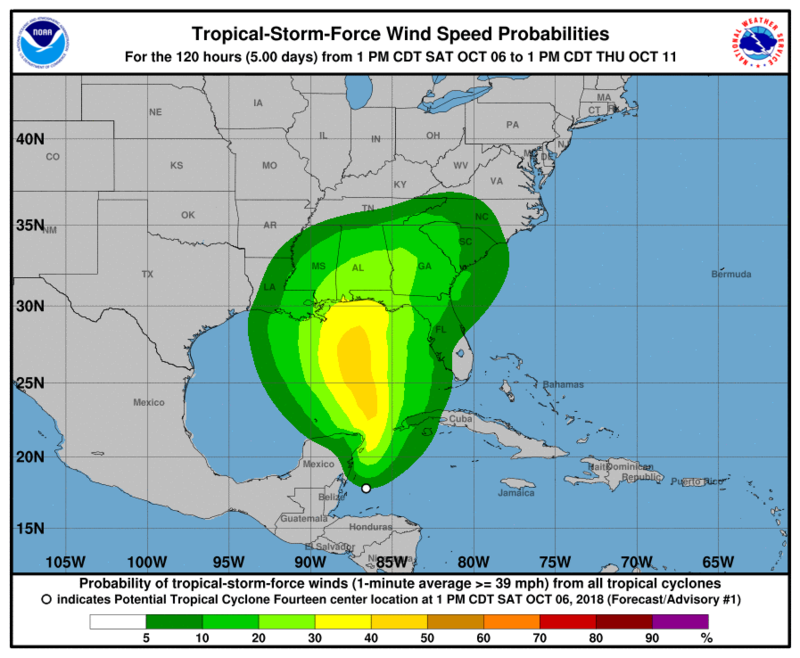 Riviera Maya in zone with 10-30% probability of tropical storm force winds. 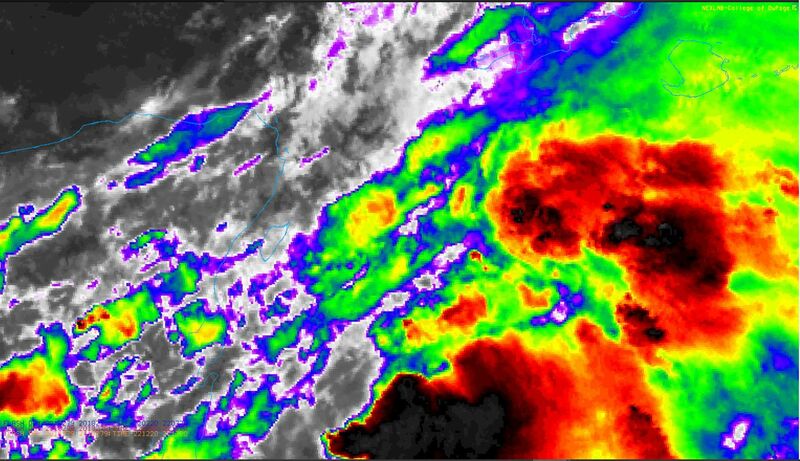 Here is latest Infrared (IR) image from GOES-16 with GOES Lightning Mapper lightning strikes included. Click on the image to see most updated loop. I have links to lots of Mexico and Riviera Maya related satellite images/loops and weather maps on my blog. The interactive cone map is below. Looks like worst winds arriving later tomorrow (Sunday evening). But expect rounds of heavy rains on and off the next couple days. 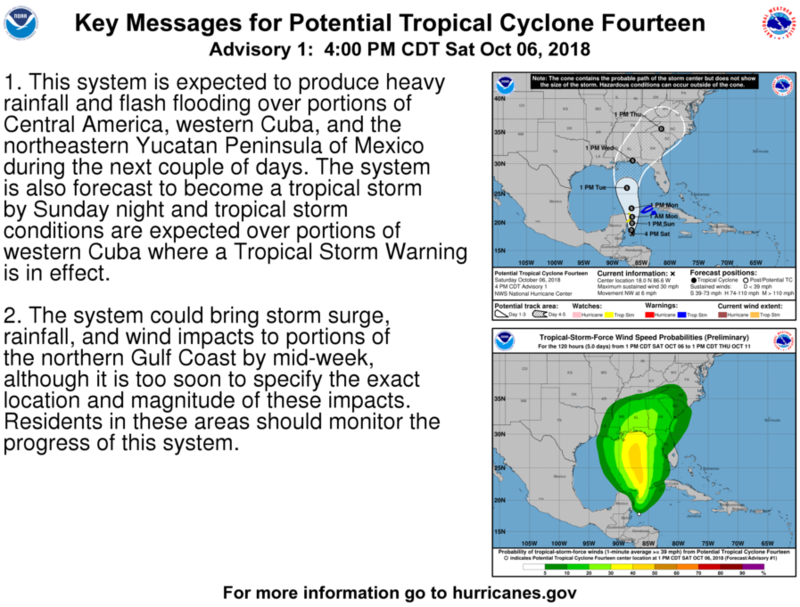 The 7pm update is now available from the NHC. 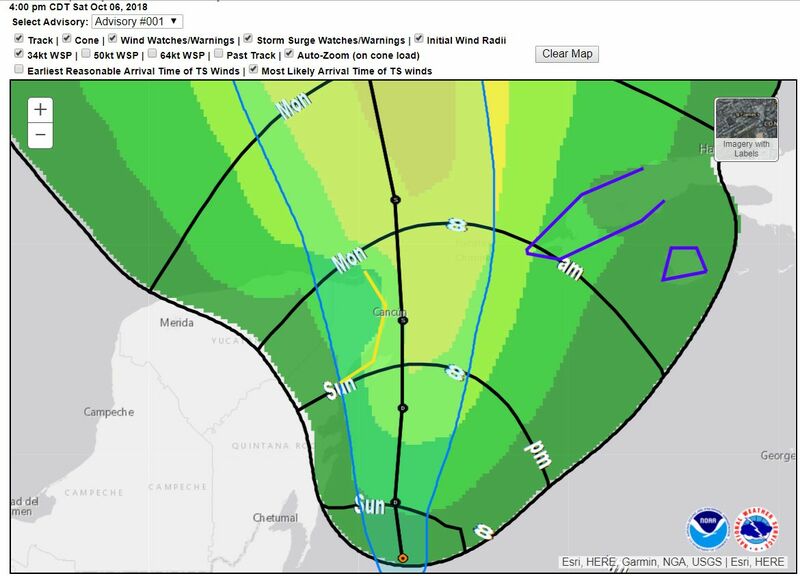 “The system appears to be moving northward near 6 mph (9 km/h), and this general motion is expected for the next couple of days. 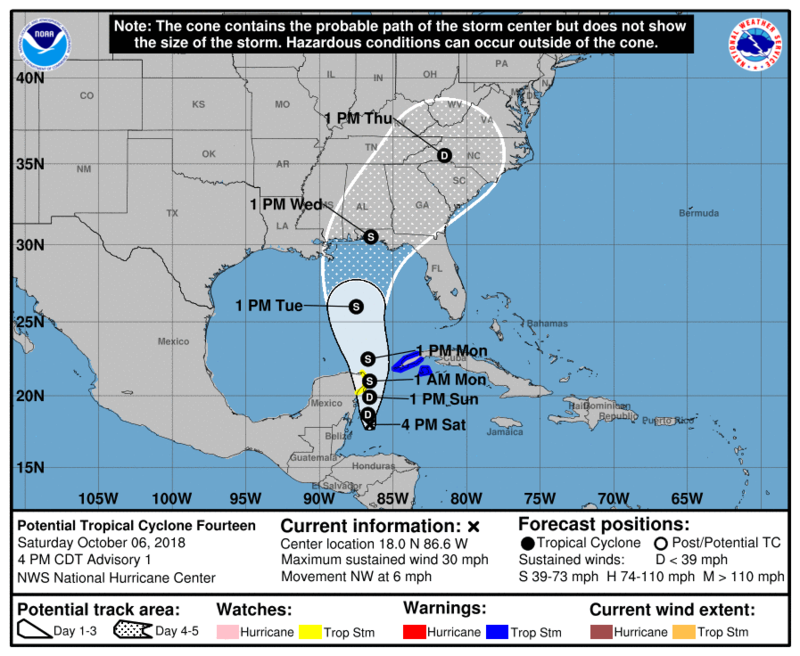 On the forecast track, the low or the tropical cyclone should move near the eastern coast of the Yucatan Peninsula of Mexico tonight through Sunday night, and then move into the southern Gulf of Mexico on Monday.